YAY!! We received another sighting yesterday!!!!!! I do get more calls then I post, and I save the best for all of you! This sighting was from 2 witnesses both seeing Andy clearly, he was sitting and observing, then turned around and headed back into the woods. This was within one of his 2 known “hot zones”, it was a little further away from the sighting last week but all in his same favorite areas… We are currently looking for his possible paths and routes from one area to the other. Also still researching possible repeat appearances, or feeding areas. We still have feeding stations and cameras, as well as some traps, most importantly right now we need to try to encourage Andy to develop a pattern we can monitor and hopefully be able to start to anticipate his arrival! Some very special Andy volunteers have created and printed Andy info sheets for the residents currently in his hot zone areas. This explains in greater detail why it is so important to keep eyes and ears peeled, and also explains that we have CONFIRMED his presence with questions, a photo line up i.d. card, and of course with the help of the most talented team of scent trained dogs!! Also we have specially designed posters for our cars so we can be driving billboards! We have included his Facebook page on the posters because I feel it is so beneficial for local residents to be able to keep up with his story and get up to date progress reports, to keep the awareness that Andy is still there!! The neighborhood has been so very supportive and helpful and for this I am so grateful as I am completely relying upon their phone calls to be able to continue to move forward in the way that we have been. I am sure it feels to all of you like a lifetime between sighting updates, sometimes it feels like that to me as well, but please know that sooo much team Andy work is going on between the excitement of our sighting phone calls. It is because of all this Team Andy work that I have been blessed to get as many calls as I have gotten, in fact the last 2 sightings had only been reported because of 2 very dedicated Andy supporters, they happened to be in the right places at the right times and collected info and called me to report it! What a phenomenal group of people we have, both on the ground and online. Your help and support is something I could not go on without, and I thank you from the bottom of my heart. That is wonderful news! Hopefully Andy will be back with you very soon. I wish you would at least rescuers know where he was seen. Most rescuers have a lot of experience with shy dogs. At these sightings, food must be placed on a daily basis at the same time and hangers with the owners sweaty clothing hung ! I have reunited a dog with his owner after 2 month on the lam. He was lost from Winslow Park in Westport, and found 2 month later in Rowayton. I had suggested to the people who saw him to put food out every day and I had called the owner who in the meantime had to return out west to FedEx me his sweaty clothing. We then hung them up on hangers and after 1 week the dog stayed put, ate his food and hung around the neighbor hood. When the owner drove all the way from out west, he called his dog at the house where he was fed and the dog came running like a devil to his owner and both were reunited. I am not saying that might happen with your dog, but this dog was very shy as well and he was unneutered. I sometimes get the feeling that this is all a hoax because in the 17 years I have been rescuing animals, nobody ever got their dog back after 6 month on the lam without experienced rescuers. I am not saying that I am THE rescuers with the most experience but I have had a lot of luck reuniting dogs with their owners. I wish you good luck for sure because it just irks me that you are trying so hard with no success! Hi Evelyn, thank you for your suggestions. We are currently working with the top lost pet detective in the country, we have a team of tracking dogs that has been on site, and have been using these scent specific trained dogs to confirm or negate his sightings. We have multiple feeding stations, 2 large enclosure traps, 3 coyote size hav a heart traps, and about 11 night vision stealth cameras. We have narrowed down his area but he has not been returning to the same location more than once, that we are aware of. I have repeatedly spent nights out in the general area where he has been sighted but it is too large an area for us to confidently say he would return to a specific location. I have walked my dogs in the area and left my scent, he is going to be more concerned with food than my scent at this point due to the extent of time that he has been out there, but of course I cover all my bases. There are other cases out there of dogs missing for even longer than Andy, I am confident we will get him home very soon. Forgot to ask, nobody ever is saying anything about what the dog looks like, is he skinny, mal nourished looking, dirty, clean looking and such…how can a dog that has been missing for 6 month be still around without anyone making comments about his appearance!?! It’s a miracle if he gets to eat garbage and still looks healthy! Just wondering!! Andy has been reported to be in good weight, but looks ungroomed. 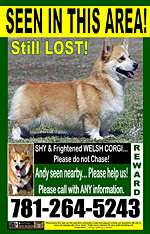 Remember he is a corgi, it does not take a large quantity of food to sustain him, there is a substantial amount of people feeding cats outside, either their own pets or feral cat colonies (which we are currently looking into) so food is not hard to come by for a clever corgi! such good news!!! keeping my fingers crossed that you have him in your arms soon!!! It would be very helpful to know exactly where these hot areas/sightings are. I live and walk my dog in what I think is the general area where he’s been spotted, but the more specifics I know, the more useful my eyes and ears can be. I realize most people following this sage =aren’t= local, but for those of us who are, these vague reports are actually as far from helpful as they could possibly be. Jordina good advise there regarding your old clothes and a feeding plan everyday….. are you trying that? replied above 🙂 Thank you! Anything new since the big move to CT?